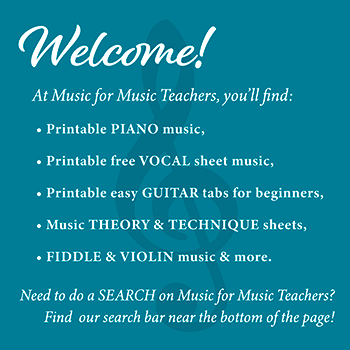 Download this free piano sheet music for beginners to print in middle C position. The easy arrangement features just the melody alone, and the harder version adds I and V7 chords. Please scroll down the page for the download links. The melody of Eensy Weensy Spider fits right into the five fingers (plus one left hand finger), so there is no need to shift the hands. It's fun for kids to play songs on the piano that they are familiar with, and even more fun to play and sing this song for their little brothers or sisters. The easy arrangement above features melody only. But if your student easily conquers the melody of Eensy Weensy Spider, ask them if they'd like a fancier version. After kids have learned the basic melody, adding left hand chords is not very hard, provided that they have experience using chords. Therefore, Mary Had a Little Lamb with two hands should be well in hand before they try Eensy Weensy Spider piano sheet music for beginners with chords. I hope your students have fun with this easy beginner song piano sheet music!